Then Jesus went about all the cities and villages, teaching in their synagogues, and proclaiming the good news of the kingdom, and curing every disease and every sickness. (Matthew 9.35)This week I’d like to finish up our look at Jesus’ “already present,” but deeply obstructed Kingdom that we began to consider last week. In the above verse, we find once again, the picture of Jesus as an itinerant teacher, traveling from place to place within Israel, proclaiming “the Kingdom” has arrived. What we also find in the Jesus story is that there was, what many call today, negative “kick-back” to Jesus’ announcement of the Kingdom’s arrival. In short, the Kingdom was a radical reorientation of how humanity does life, based on a radical paradigm shift in how we see God, ourselves, and everyone else around us. But there were many who were benefitting by how life was already oriented. To Jesus’ new reorientation, they did not feel positively in the least. Jesus met deep resistance from the very beginning (see Luke 4.28-29). He met anger. (see Luke 13.14) He was bringing what He considered to be “good” news, but He was met with suspicion, accusations of his teachings being dangerous. Crowds too, voiced “complaints” about what Jesus was teaching. While some saw what Jesus was sharing as truly good, others felt he was “deceiving” everyone. (see John 7.12) Jesus met, time and time again, stubborn resistance. Sometimes he faced censure and rebuke by the religious leadership of his day. Sometimes he endured being labeled as a heretic, an outsider, whose views, if were adopted, would bring about the end of the entire nation of Israel. And the bottom line is that many to whom Jesus brought the good news of the Kingdom to, initially, by their responses, betrayed that in reality they were very afraid. Which leads me to why, I believe, we see in Jesus, so much compassion and genuine sorrow for his rejecters. (see Luke 13.34) All the rejecters desired was for the promises made to Israel of long ago be fulfilled. They longed for “the restoration.” They believed the covenant made with them involved their being “obedient.” And all they really wanted was to be obedient enough so that the promises, according to their understanding, could be finally fulfilled. This too is why Jesus was viewed as such a threat. Jesus was, in reality, the fulfillment of each of those promises, but it involved changing some significant things as well. And this they could not handle. What response did Jesus get in return? These changes threatened too much. In response to his “Kingdom,” Jesus found fear and anger from the very ones who claimed to be “the people of God.” All the while, in Jesus, God was standing right in front of them, the very God, whose people, they claimed to be. But here is the beautiful part. Jesus met their anger with compassion, because he knew they didn’t know what they were doing. To their intolerance, he sought to explain their intollerance as simply the result of their ignorance. To their fear, he saw only infinitely valuable souls to be won from fear (not fear of God, but fear of change) to love. To those who were so addicted to their certitude to embrace the questions that following this new Jesus would bring in its tow, Jesus felt sorrow. To their closed system that was now being threatened by Jesus’ radically inclusive love, Jesus simply loved even more. To a system that had become stagnant, a protecting and guarding of the old ways rather than a continual movement along side of God into the “new”, Jesus, incomprehensibly, continued to sow the seeds of hope. While the religious leadership of Jesus’ day had become oppressive, Jesus saw in their plight, a plight common to all humanity, and not unique at all. They were not alone. To their tactics of manipulation and control, Jesus excused them as simply being blind, immature and inexperienced. To there extreme religious dysfunction which would ultimately turn into full blow homicide, no Deicide, Jesus understood they were simply . . . afraid. 1)The gospel was to Jesus the announcement that the Kingdom (the new creation, the new humanity) had come. 2)Jesus’ commission to those who were his followers was to proclaim this SAME gospel. 4)Jesus’ intention was that this gospel, the good news announcing that his Kingdom had come, would be proclaimed to each and every nation. What is this Kingdom? Why was is so threatening to the religious leaders of Jesus day that they had him crucified? Why was it so threatening to Rome that Rome had Jesus’ followers crucified (or beheaded)? The answer is in the fact that whatever Jesus’ Kingdom encounters, this radical reorientation of how we do life, based on a new way of seeing God, ourselves and everyone else around us, seems at first to be threatening. Does following Jesus ever feel, to you, as if it threatens to change everything about your life too? Well, I’ll tell you a little secret. It does. But the changes that Jesus brings are changes that lead to life. The course that this world is on is one that ends intrinsically in death. Jesus came that we might have life. 1)Read, prayerfully and thoughtfully, DAILY, through Matthew 5-7 for the next seven days. Be mindful of the voices in your headspace that will try and marginalize, or explain away, what Jesus was actually teaching. 2)List some ways that Jesus’ teachings feel threatening to you. Then list how those same teachings could also set this world on the course toward a “new humanity” (Ephesians 2.14-15), a “new creation” (2 Corinthians 5.17; Galatians 6.15), life rather than death, if those teachings would be embraced by us. 3)Be prepared to share openly and mutually your insights and discoveries with your HeartGroup, dialoging with each other and discussing each respectfully. Remember to practice the fifty plus “one anothers” of the New Testament most of all. Wherever this finds you today, remember, the Kingdom of heaven is not a kingdom in heaven, but the Kingdom OF or FROM heaven, come to earth in the person of Jesus Christ. Jesus gave us a way to heal our world, one person at a time. So today, go out and love like Jesus did, think like Jesus did, feel like Jesus did. 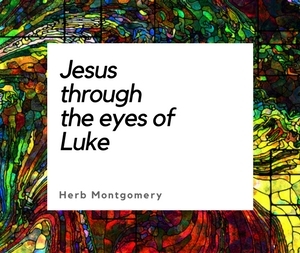 Embrace Jesus’ picture of the Father, how Jesus taught us to see even ourselves. And continue to embrace how Jesus taught us to see, also, everyone else around us. Keep living in love (Ephesians 5.1,2), and keep enlarging the Kingdom. I love you guys, I’ll see you next week.